So many things happened after my last entry. The days passed by so fast and become weeks and there wasnt a perfect moment to sit still and reflect the things I had experienced. After a very long time me and Kai had the chance to spent a lovely afternoon at our favourite seaside spot. It is truly amazing how energizing it is just to sit on the beach watching the small waves break. It is as if all the worries, negative and stressful thoughts disappear until there is nothing in your mind then peace, calmness and satisfaction. I am very thankful for these precious moments as they are a gift from above. I felt happy and thankful for the weather, which was simply gorgeous and I enjoyed having Cake and Coffee at our favourite Countryside Café, which is something we always do when we are at the Baltic Sea. 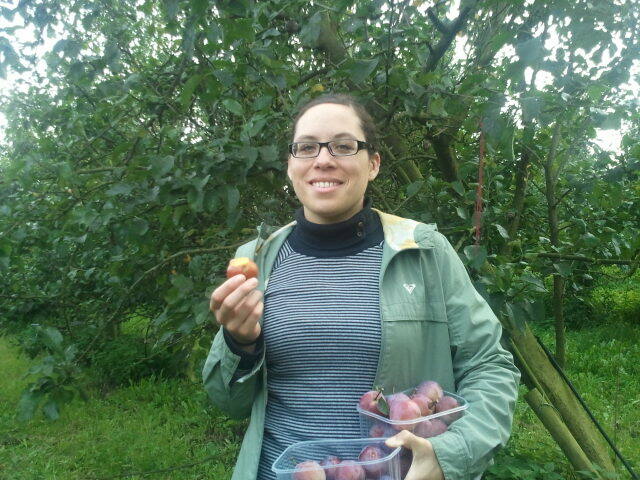 We even took some time to walk through the orchard and pick plums. In this past weeks I also entered driving school, which was a big thing for me. I don’t know why I didn’t took lessons earlier maybe I was afraid of the new situation or simply couldn’t imagine myself driving a car… Now that I passed my third car ride I am happy as a Girl can be, that I finally took this step and I hardly cant wait to sit in that car again. Talking about serving other people. It was a big pleasure for me to pack and send a birthday surprise to a very special someone this week and I cant wait to see how this person reacts on my surprise. I also sent a package to an American woman, we don’t know each other very well, whom is suffering from Insomnia like I tend to do a month ago. As I heard that she barely sleeps at night, I told her about me drinking a special “sleepy-tea” that helped me very well. In about one week she will receive my package and I do hope the tea is going to help her as much as it helps me. These “small things” are making my day. When I sent someone an e-card or help them out if they need someone to talk. Checking in and wishing people a great day, sending them articles, that I find interesting… or even walk 6 km in a Charity walk to collect money for a cause. You can see the world around you changing if you start to serve others and it is an amazing feeling, which really can make your day and lift you up. I am so much looking forward to this upcoming weeks as it seems to be a very exciting time at the moment. I feel so much alive, thanks to all these new things and that is a big change to all the last months, which went by in a moody blur. Which are moments you are thankful for? How do you serve other people?